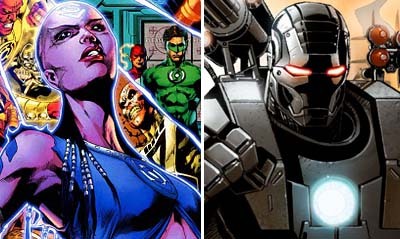 *** The coolness that is War Machine is getting his own series back - but because it'll grab more fans of the movie it's called Iron Man 2.0 (War Machine was in the recent flick right?) Writer Nick Spencer teams with artist Barry Kitson from the brilliant JLA Year One to highlight that brains and strategy over firepower is what todays War Machine would be based on - just don't call him that on the cover - it doesn't sell. *** In the mid-nineties Marvel watered down a great idea by having the dark side of Charles Xavier mix with a splash of Magneto to make Onslaught. 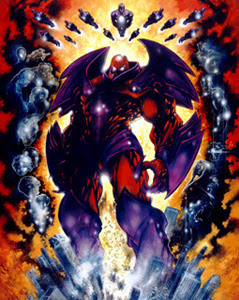 Well in February Onslaught Unleashed mark's the big bad's return to the Marvel U and destruction is his Valentines Day gift. Here's just hoping he's left that Magneto influence behind, and emerges just pure unadulterated evil Chuck. *** The news Batman: Year One and Green Lantern: Emerald Knights were next to get the animated treatment lead into the tease another of DC's colourful Corps will get their own title. Who will it be? Anger? Fear? Greed? While I would love it to be the Blue folks of Hope, something tells me it's probably going to be Indigo. What about you? *** While this spot should go to the news Moon Knight is getting another series, its better to point out Marvel gave away a few hints on the return of CrossGen. 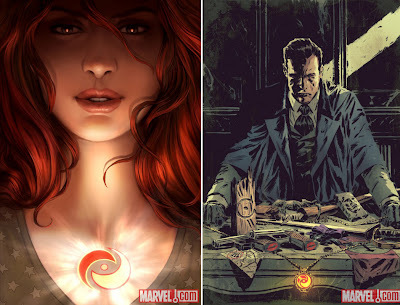 Namely a redhaired woman with a sigil, and a new picture of detective Ruse, with writer Mark Waid's name thrown out. Now lets hear something about El Cazador. What have you been able to identify Dan? Exactly, I love the way they have hidden clues to the books on the table in the Ruse teaser. I probably stared at it too long trying to tie something to every book I ever picked up, so I don't know if what I saw is real or just wishful thinking. Just not sure about the hair with the purple tie? Anyone have any clues? Miranda Cross from Ruse maybe?